I’ve often written about my admiration of and appreciation for small, independent book publishers, those folks who are in the business much more because of their love of books than their pursuit of the next big blockbuster. Publishing these days has an ever-slimming profit margin amid fierce competition, and that makes things even more challenging for those who do this for love. A small publisher that has drawn positive attention for its business model and a gratifying level of success is She Writes Press. In 2016, books from She Writes Press were awarded seventeen medals at the Independent Publisher Book Awards, the most awards to one press in that year. Under the guiding hand of publisher Brooke Warner, the press has gone from a catalog of eight titles in 2013 to an impressively long list for both spring and fall in this, their six year. 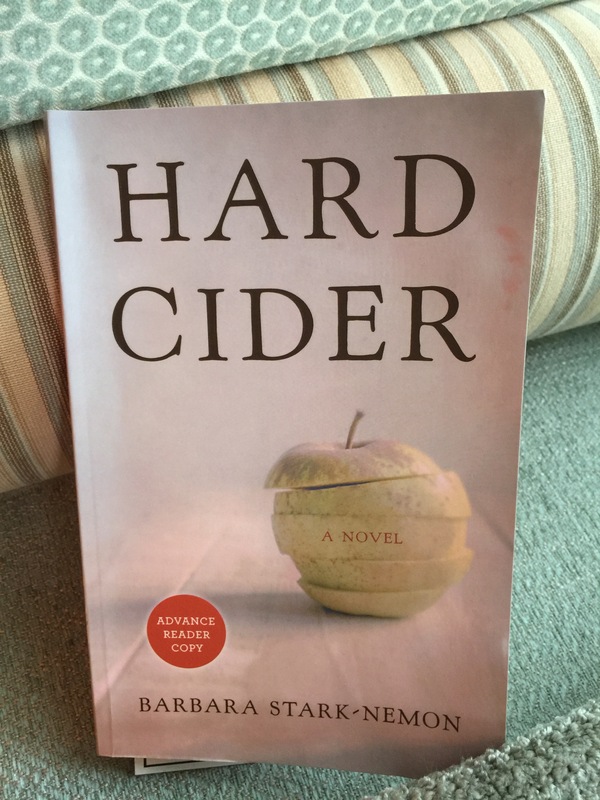 One of the titles being released this fall is Hard Cider by Barbara Stark-Nemon. Stark-Nemon is an alumna of She Writes Press, which published her award-winning debut novel, Even in Darkness. (See my review of that book for LLNB here.) Fans of the first book—a historical novel covering many decades leading up to, though, and beyond World War II—should expect a quieter, more intimate, contemporary portrait here. What remains the same, though, is the focus on a single family through the eyes of a strong female protagonist. Abbie Rose Stone is a mature woman who, having built and raised her family through a number of trials, is now ready to take on a challenge entirely for herself, simply for the joy she feels it will bring her: starting a business producing hard cider in northern Michigan. Her husband and three grown sons have trouble understanding her desire and even more trouble being supportive of it. Abbie tells her own story, which she starts by recounting the trauma of losing their house to arson. She weaves in the details of building her family with husband Steven through infertility and the painful journey of treatments and disappointments, including a brush with surrogacy that Abbie cannot bring herself to repeat. Instead, over time, they adopt two boys, Alex and Andrew, and then end up having one of their own—the third boy, Seth—without any intervention. From the outside, Abbie seems to have a comfortable, successful life in her early retirement, with a house in Ann Arbor and another on the northern peninsula, with time to spend on various quiet projects now that all three kids have established lives of their own. But the cracks are there. Each conversation with Steven or the boys is an exercise in eggshell-walking, in which Abbie carefully reads tone and sometimes body language in her attempts to navigate through the rocky shoals of each relationship. She mentions eyeing, and sometimes reaching for, the scotch bottle, and though she seems to drink in moderation, there’s a hint that the impulse is something she wrestles with. Alex in particular represents her biggest maternal struggle, and perhaps failure. A strong-willed child who tested boundaries all along the way—though we never quite learn how—Alex’s parents finally felt that sending their troubled adolescent to boarding school was the answer. As an adult, his troubles stem primarily from his desire to protect the underdog, so that his best impulses cause the greatest issues. Now, as Abbie tells it, Alex has built a good life for himself a few states away, and she pushes to strengthen her connection with him. As she spends an increasing amount of time at her northern retreat, learning the ins and outs of the hard cider business, Abbie meets a young woman, Julia, who seems to have a particular interest in Abbie’s family. The mystery of Julia’s attention becomes the book’s central question, though the true journey is Abbie’s reaction to what she sees as an assault on her family and on the delicate balance that she still struggles to achieve and maintain within it. Stark-Nemon’s writing pulls us along, keeping the pages turning as we make this journey with Abbie Rose. For women of a certain age who have their own stories of dreams deferred in service to family, Abbie’s story resonates. Many readers will bring their own understanding of the landmines lurking when a wife and mother works to carve out a role separate from the centrality of family. There are some opportunities that Stark-Nemon misses. One of the traps for an author of first-person narration is the tendency to tell more than show. Abbie describes her relationship with Steven and alludes to their issues far more than we see or experience them for ourselves. Often, it feels as though characters are talking at each other rather than to each other, making their points but not necessary striving for mutual understanding. Emotional scars left by trauma—the arson, Alex’s feelings of abandonment—are only tangentially explored. 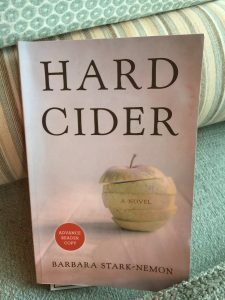 That said, Hard Cider is a warm and inviting book, which may make readers long to spend some quality time in northern Michigan, enjoying the seasons on Abbie Rose’s lakeshore retreat.